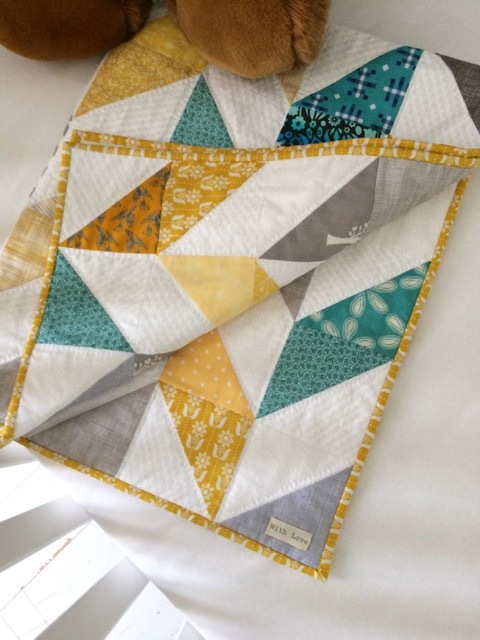 Here are the pictures of my Herringbone baby quilt finished and offered to my niece in Paris. 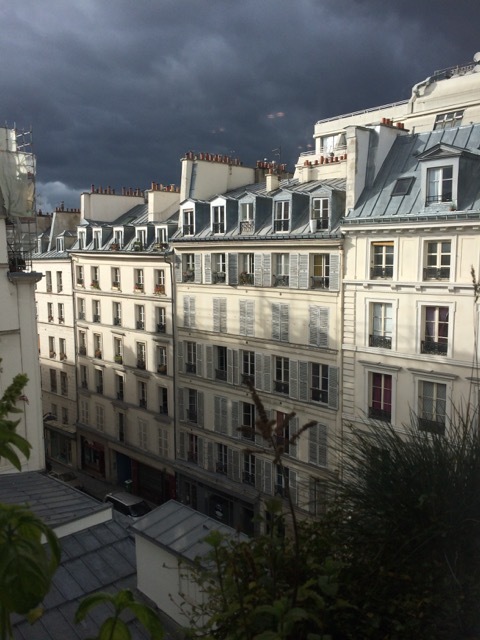 The gray color recalls Paris' sky, the blue is for the baby boy and the yellow gives a sunny touch. To make the triangles I cut strips of 5" wide (12.7 cm) from each color, then squares of 5" (12.7 cm) and then cut diagonal to obtain 2 triangles. It is so lovely! Love the colours, very quiet yet not dull at all. Congrats on this charming finished. 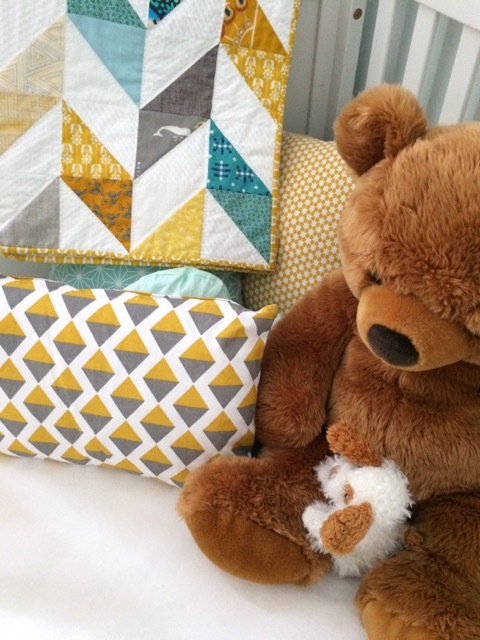 Oh, she is a lucky girl to be offered such a lovely quilt. I always enjoy seeing what you have made Christine, your choice of fabrics and colours are so modern, there must be great fabric shops in Paris. 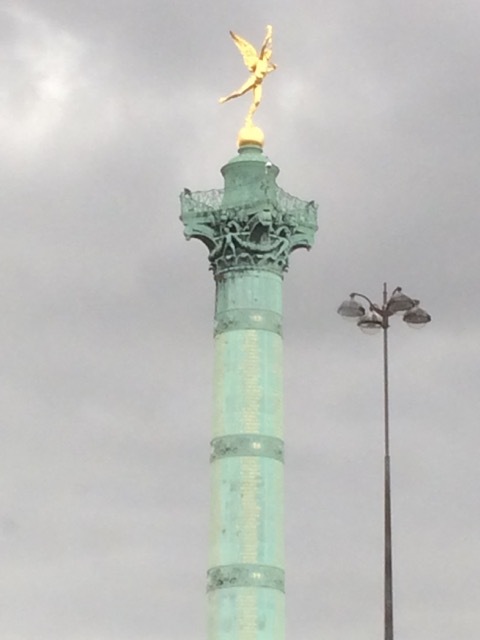 J'adore les couleurs et le style ! Bravo pour cette réalisation Christine. Je te souhaite de passer de bonnes fêtes de Noël en famille ! 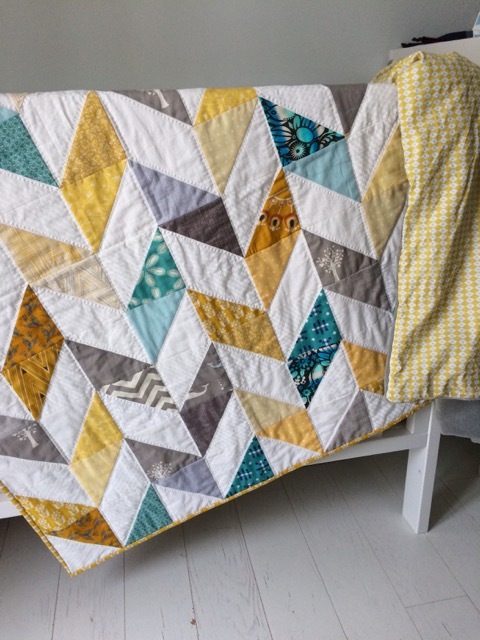 A lovely quilt, your colours are so pretty together! 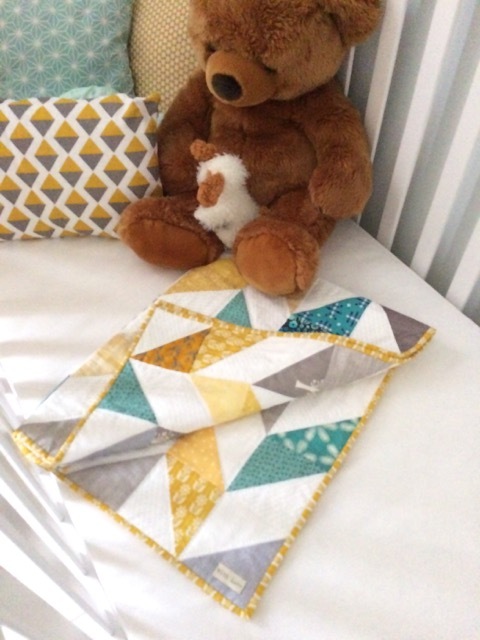 Lovely colours for this beautiful quilt. J'adore le choix des couleurs ...A la fois peps et moderne. Merci CHristine de nous faire partager tes réalisations. Merci Zaza pour ce gentil commentaire! Oh, this is beautiful! I love the colours. les couleurs sont superbes, puis je vous demander de quelle collection font partie ces tissus ? Joyeuses Fetes de fin d'année. La plupart des tissus sont des "scraps" de différents designers, tous importes des USA. Joyeuses fetes a vous de meme. Beautiful! The color choices couldn't be better, and I love that your herring bones are 'mix & match'. Thanks Robby! The "mix & match" is always a chalenge for me but I think that it is more interesting than using the same colors and the result is as well more interesting. 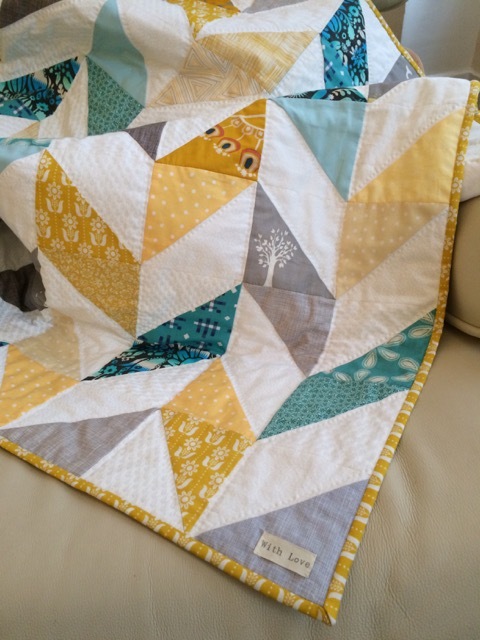 Beautiful, beautiful quilt! 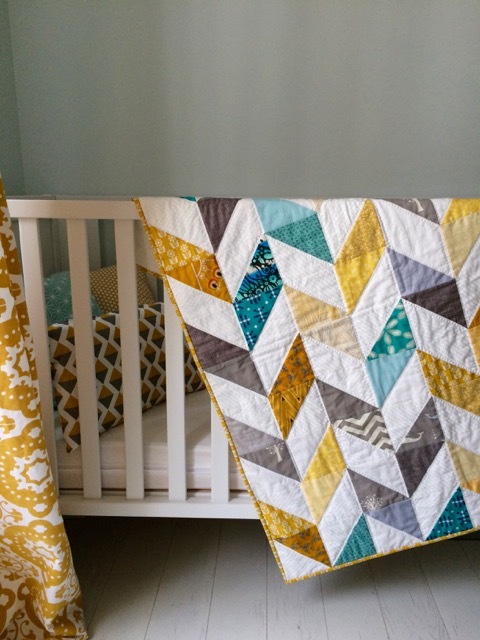 I love the colors and the quilting! 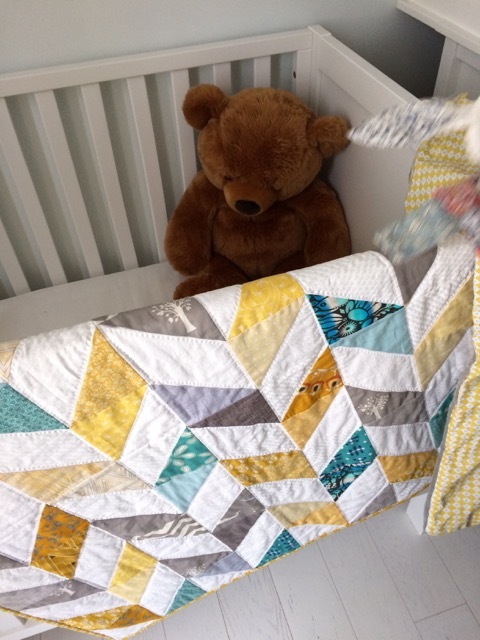 I have a first grandchild arriving in 2017 and am looking for inspiration for baby quilts! Thanks!! Charmant : plein de tendresse et tellement moderne; comme toujours réussi ! Love your palette, I can really see it in the inspiration photos. Absolutely beautiful. Do you have a pattern to share or a link for the pattern. 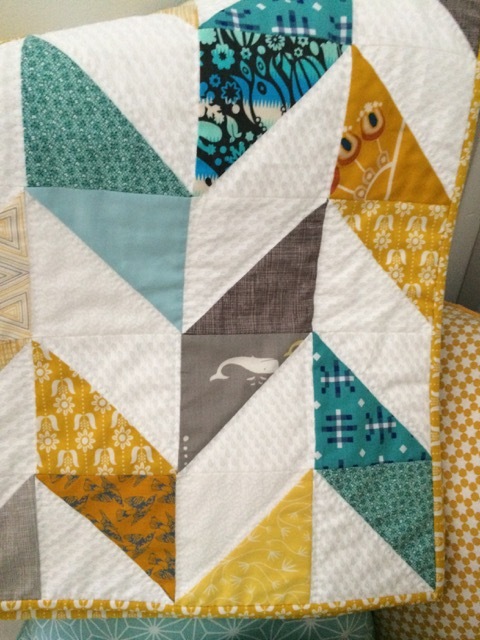 Would love to do a Herringbone quilt for a gift for Christmas . Kindly let me know.